Learn how to calculate Annualized Volatility and know if it is worth to know about it. A lot of traders who have done my options trading course, want to know how to calculate Annualized Volatility. Volatility is very important factor in option trading. This is the reason many traders want to calculate Annualized Volatility, basically to try to figure out future prediction of Volatility. Annualized Volatility is partly Technical Analysis. 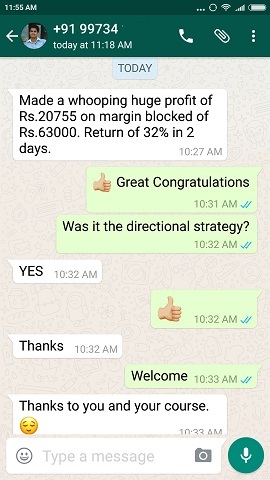 Basically before traders want to take a trade they would like to know if the stock will move and in what direction. 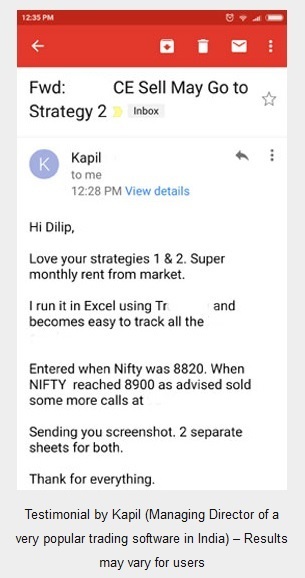 If right they make money, if wrong they exit with a stop loss. Historically Stocks are more volatile than Stock Index. 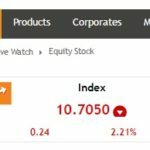 The reason is stocks are individual entity but Index is a group of stocks. However Annualized Volatility can be calculated on both Stocks and Index. Volatility is the measure of variation of a stocks movement over time. 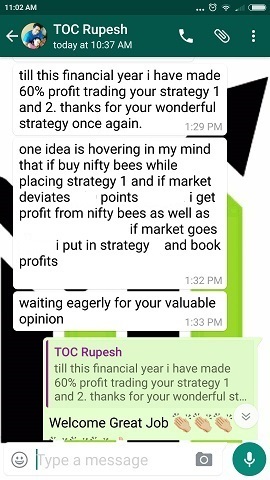 Over time is not specific but general depending on what is the traders view and what trade he is taking. Some stocks are too volatile intraday, but some stocks are not so volatile. 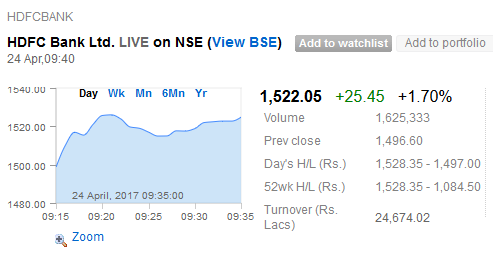 For example stocks like HDFC Bank Ltd, are not so volatile intraday, but stocks of smaller companies are very volatile intraday, like GMR Infrastructure Ltd. Similarly it is has been observed that some stocks are too volatile over one year time, but some stocks are not so volatile over one year time. For example stocks like HDFC Bank Ltd, are not so volatile over one year, but stocks of smaller companies are very volatile over one year, like GMR Infrastructure Ltd. This data is very important to know Annualized Volatility and take a trade based on it. For this we will need historical closing prices of the stock or Index. You can select the time period and get the closing. Date, Opened at, Highest Price for the Day, Lowest Price for the Day, Closed at (this will be required for calculating Annualized Volatility), Total number of Shares Traded, and Turnover in Rs. 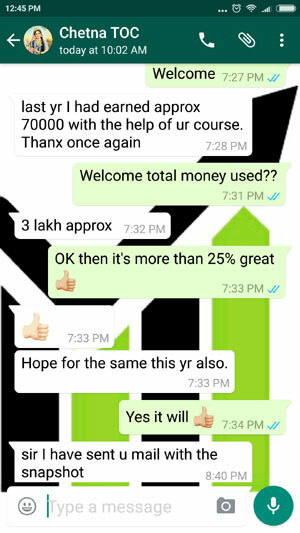 Crores. To calculate Annualized Volatility we need the closing price for the day only. In other words, subtract yesterday’s closing price from today’s closing price and then divide the result by 100. Anyone good in making Excel sheets will be able to make them at home. In an Excel sheets the calculations will be automatically done once the formulae to calculate the percentage change is copy pasted in all columns. Please note that to calculate Annualized Volatility I have taken out the closing price of 03-Apr-2017 because we need the previous day closing price. We have not taken out that price as somewhere it has to start and end. We have got the most important information. With this information we will find out the Volatility of Nifty from 01-04-2017 to 24-04-2017. Please note that to find out the Annualized Volatility you will have to take out one year closing prices. However since here I am just trying to explain how to find out Volatility, I am taking out only few days of closing prices. To take out Volatility over a time we need to find standard deviation formula. You can use Excel to make this process easy. In simple math, Standard deviation is the degree to which the prices vary from their average over the given period of time. 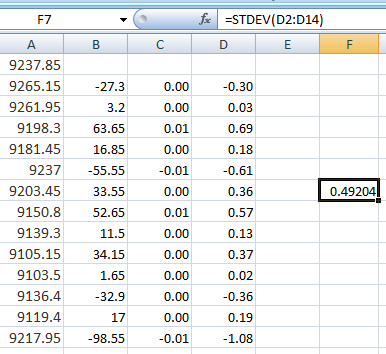 See the image below, in Excel, the formula for standard deviation is =STDEV(from col no:to col no). The col no is the column which is used to keep the percentage change from the previous day. As you can see I have used the formula for standard deviation, =STDEV() and got the standard deviation as 0.49%. This is daily standard deviation of Nifty from 01-Apr-2017 to 24-Apr-2017. Like this one can take out standard deviation of one year. We have got the standard deviation. To get the Annualized Volatility we need to multiply daily standard deviation by the square root of 252. Because in one year almost 252 are trading days. Rest are weekends or holidays when the markets are closed. This can be done in Excel. The formula for square root in Excel is =SQRT(). Square root of 252 is 15.87. 15.87 * 0.49 = 7.77%. 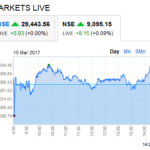 Based on the price movements from 01-Apr-2017 to 24-Apr-2017, Nifty Annualized Volatility is 7.77%. Note: For very correct Annualized Volatility it is recommended take at least last 60 days closing. The Annualized Volatility is no guarantee that in one year the stock or Index will move only that much in a year, but it gives a rough idea that most of the time that will be the most movement. 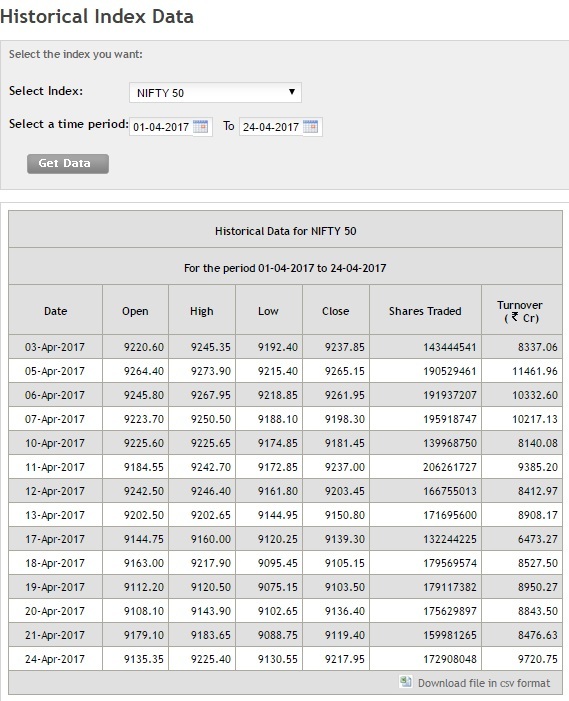 In our case 7.77% is Annualized Volatility of Nifty based on the period of Volatility from 01-Apr-2017 to 24-Apr-2017. Can We Tweak This Data? Yes Volatility can be found out for any time period. You can calculate Monthly Volatility or Weekly Volatility. Traders looking to trade Bank Nifty Weekly Options can find out Bank Nifty Weekly Volatility. For Monthly Volatility, get one months volatility, and multiply the daily volatility standard deviation by the square root of 21. For Weekly Volatility, calculate the weekly percentage change for at least 5 weeks, and take the standard deviation of that data. To Annualize the weekly volatility, you will need to multiply by the square root of 52. One year has 52 weeks therefore multiply by the square root of 52. Annualized Volatility Calculation Is It Worth It? It is a mixed answer. Like I said Annualized Volatility is no gurantee that the stock will move only that much, however it gives a rough idea about the stocks movement. Some traders do take a trade based on Annualized Volatility. However there is no historical data if trades based on Annualized Volatility make more than 50% times profit. Thanks for the article on Volatility.